I have written here about doctoral student Lukasz Rzepka’s research on the Jewish community of Ozarow, where both he and my father, Ben Zion Wacholder, were born. My father’s memories of the liquidation of Ozarow are recorded on the website maintained by my niece Shifra Goldenberg. Thanks to Lukasz, creator of the BOZnica series to preserve the memories of the Jews of Ozarow, my father’s story is now available in Polish as well. The whole plant has the shape of a menorah. Man is a flower, part of a plant. It is a symbol of a survivor who shines like a lamp. Red correlates to the red doors in the BO?nica logo, which symbolize the martyr’s death of Jews from O?arów. 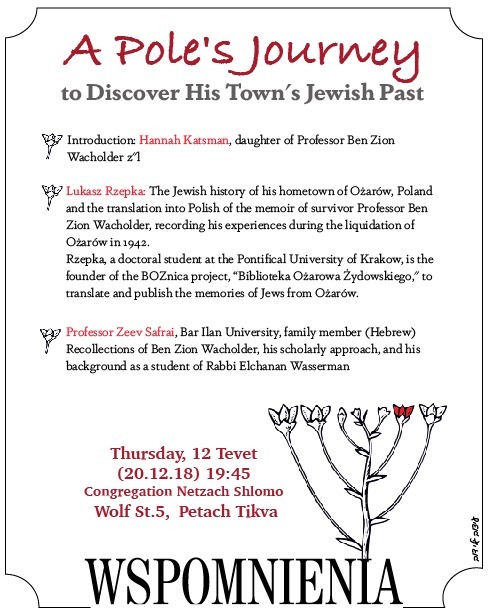 Lukasz arrived in Israel and will be speaking in Petach Tikva tomorrow evening (20.12.18) about his research and the Jewish history of the town. The slides will be in Hebrew and English. My relative Professor Zeev Safrai, whose father Professor Shmuel Safrai was a close friend of my father, will be speaking (in Hebrew) about my father’s scholarship. See the flyer below for more details. Those coming by car are advised to park on one of the surrounding streets as the synagogue is located on a small street. For more information, please text me at 054-4602372. My mother and her family were from Ozarow. Her entire family was murdered including her 2 year old son and first husband. My mother fled to Krakow and eventually was fortunate enough to work for Oskar Schindler and she survived as s laborer in his factory and was then liberated in Brunlitz , Czech. I visited Ozarow 4 years ago and spoke at an auditorium in the high school. It was a chilling but moving experience. I would love to speak with you about your research and share our collective histories. Best Regards. Thank you Steven! I will email you.